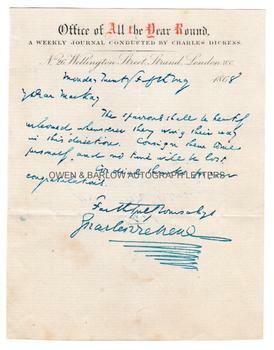 CHARLES DICKENS autograph letter Signed. ALS. 1p. Office of All the Year Round, 26 Wellington Street, Strand, London, WC. Monday 25th M[a]y, 1868. To [Charles] Mackay. Sold together with a contemporary steel engraved portrait. "The sparrows shall be heartily welcomed whensoever they wing their way in this direction. Consign them to me yourself, and no time will be lost. Cordial thanks for your congratulations. Faithfully yours always, Charles Dickens." 8vo. Approx 6.5 x 5 inches (16.5 x 12.75 cms). The blank leaf of the bifolium excised to a stub which had been used for mounting in an album. Old mounting residue to stub but the text leaf in excellent condition. Fine. The portrait is an oval measuring approx. 6 x 4.75 inches and mounted on part of an old album leaf. 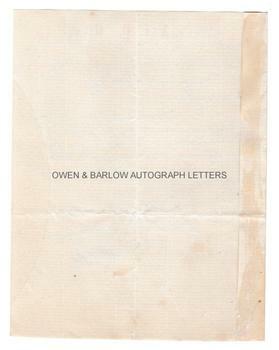 An enigmatic letter. 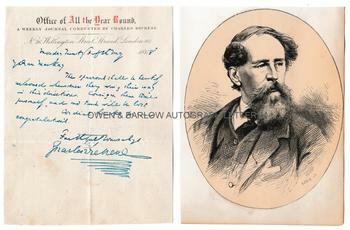 Charles Dickens is writing to his friend Charles Mackay, the Scottish poet, journalist and author. Mackay had been sub-editor of the Morning Chronicle during Dickens' employment there and the two remained friends, often working on joint projects. Mackay went on to become editor of the Illustrated London News and, subsequently, was the Times Correspondent sent to cover the American Civil War. Mackay had contributed work to Dickens' newspaper, The Daily News and possibly the "sparrows" referred to are pieces for prospective publication in All The Year Round.